Deliver effective telehealth and increase access to specialists. American Well’s clinical software and workflows allows specialists to extend their reach to connect with patients in a timely manner. The user-friendly technology encourages clinician adoption and utilization. Offer more timely and appropriate access to care by connecting clinician supply with demand. Improve patient outcomes by treating cases quickly. Clinicians adopt and use telehealth tools that fit into their workflows, allowing them to spend more time treating patients and less time on administrative tasks. Better allocate your health system's resources through a program that improves clinician productivity. Empower clinicians to practice at the top of their licensure, increasing revenue per clinician and decreasing patient wait times. Integrate with Electronic Medical Records to maintain comprehensive patient records across sites and systems. Connect multiple EMRs through bi-directional HL7, FHIR, and CCDA standards. Review content from external sources during a telemedicine encounter, such as PACs imaging and exam devices. With 99.9% uptime and industry-leading security, ensure your telemedicine program is HIPAA compliant and secure. Creating custom escalation paths and notify providers on any device. Streamline the care coordination process through case assignments, secure collaboration, and provider alerts. Reporting and analytics to track key success metrics. Track telehealth utilization, clinician response times, and tPA administration. Care team collaboration allows clinicians to communicate in real-time. Clinicians can access patient exam tools, medical records, and device data to understand the patient’s condition. Clinicians access the software from web, mobile, or best in class telemedicine carts. 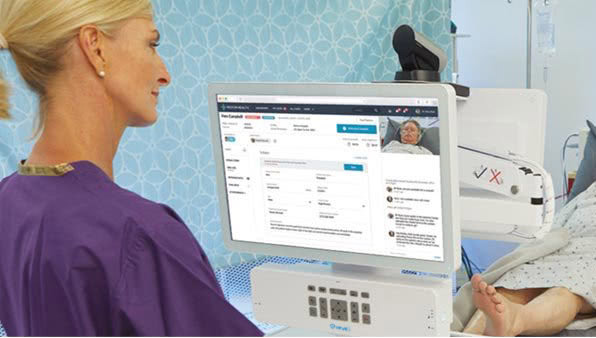 Clinicians connect right to the patient’s bedside through far end camera control, pan/tilt/zoom, and top-quality imaging.